A structure unto itself, this stately design exudes class while maintaining the level of comfort you deserve. 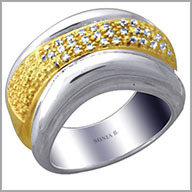 This band is crafted in sterling silver and 14K yellow gold. It features 17 full round cut diamonds in prong settings. Cinched at the center and wide at the sides, this ring is modern and edgy with a classic presence. A gentle taper at the back was added for ease of wear. The total diamond weight is approximately 0.13ct with a color of H-I and a clarity of SI1-3. The setting size is 3/8" x 7/8" with a height of 1/4"